When patients come to our Kalispell, Montana, office for a facelift consultation with one of our plastic surgeons, they often express their desire to look refreshed, but natural. They typically want to correct laxity and sagging in the lower half of the face and the neck. Our experienced, board-certified plastic surgeons, Dr. Michelle Spring and Dr. Michael Hromadka, use surgical techniques that create a rejuvenated, more youthful-looking appearance that leaves you feeling like yourself, only renewed. Women and men considering facelift surgery travel from Missoula and throughout Montana to have their surgeries performed by one of our specialists. Request a consultation using our online form to meet personally with either Dr. Spring or Dr. Hromadka, or call our office at (406) 756-2241 to schedule an appointment. Your overall health is more important than your age when considering whether you’re a good candidate for a facelift. Women and men in their 40s, 50s, 60s, and even 70s can benefit from a facelift. Each patient is evaluated based on his or her unique physical condition and cosmetic goals. The key to getting the cosmetic surgery results you desire begins with the consultation. Both Dr. Spring and Dr. Hromadka make patients feel comfortable during their initial meeting and encourage honest and open communication when discussing their aesthetic concerns. Additionally, we offer the VECTRA® 3D Imaging System to help our facelift patients envision their possible results. We are the only practice in the area to offer the VECTRA® 3D Imaging System to our patients. The advanced VECTRA system provides a realistic preview of potential results of breast enhancement, body contouring, and facial rejuvenation procedures. Based on the information gathered at your consultation, your surgeon will create a customized surgical plan designed to meet your specific needs. He or she will utilize well-hidden incisions behind the ear that don’t create too much tension, so your ears look perfectly normal after the surgery. There are many variations to the modern facelift techniques used by Dr. Spring and Dr. Hromadka. Rarely does a facelift simply consist of removing excess skin — in most cases, this is a less-effective technique that can produce results that don’t look natural. Typically, the surgeons lift the skin and elevate the underlying muscle and tissue (the superficial muscular aponeurotic system, or SMAS) in a natural direction, so you look like a younger version of yourself. A facelift does not remove any excess lower or upper eyelid skin, and it does not elevate the brows. These are separate procedures often performed at the same time as a facelift in order to rejuvenate the lower face, the eyes and the brows. Dr. Spring and Dr. Hromadka use incisions that are camouflaged in the patient’s hairline. 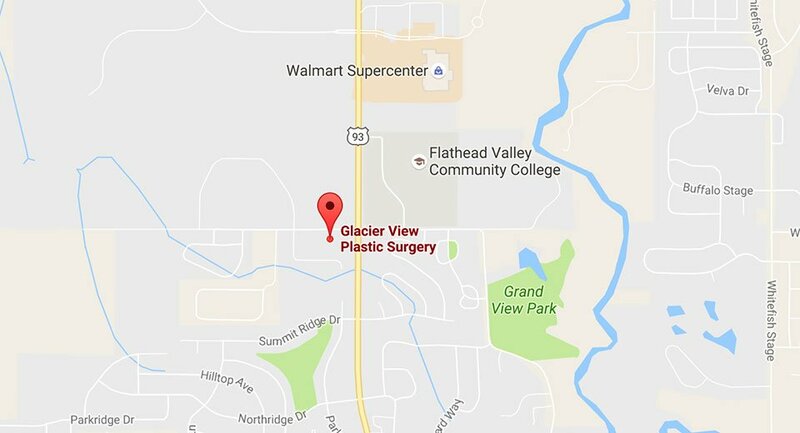 Our surgeons often use general anesthesia during facelift surgery, which they perform at The Health Center outpatient surgery center in Kalispell and North Valley Hospital in Whitefish. The procedure may take several hours to complete. Some patients are good candidates to have the procedure done under local anesthesia in the office. We will discuss the pros and cons of both options and decide with you where to have surgery. Since a facelift primarily addresses concerns in the mid- to lower face, many women and men choose to add other procedures to their facelift. For example, it is very common to add procedures for the upper face, such as eyelid surgery or a brow lift for a comprehensive facial rejuvenation. It is also quite common to incorporate mid cheek fillers such as JUVÉDERM VOLUMA® or facial fat grafting to reshape the junction between the lower lids and the midface, which loses volume and falls as we age. A more substantial neck lift may be incorporated into a facelift procedure to address loose, sagging neck skin with visible separated muscle bands and the appearance of a double chin. All of these options will be discussed as you develop your personalized plan for facial rejuvenation. The recovery timeline following a facelift involves both physical healing and social comfort level. Patients recover at their own pace, but most are pleasantly surprised by the relatively little discomfort experienced after facelift surgery. Our surgeons prescribe medication to manage any discomfort you may feel. Most of Dr. Spring and Dr. Hromadka’s patients feel comfortable being out in public and meeting people about 2 weeks after their procedure. Patients who wear their hair long can cover the incisions around the ears and may be ready to go out by 10 days. At this point you can also use makeup to cover residual bruising. You can expect the results of a facelift to last for many years. Depending on your age at the time of the surgery, along with factors such as the quality of your skin, genetics, lifestyle and your overall health, you can enjoy your results indefinitely. The aging process doesn’t stop, of course, so gravity and the loss of skin elasticity will still impact your appearance. However, you will continue to look young for your age even as aging progresses.